Its been almost three years since we last saw MGMT. That night they opened up for Fiery Furnaces at Music Hall, and MGMT was soon to sign with a major label and release their outstanding debut Oracular Spectacular (we bought a pre-release copy at their merch table that night). We recorded that 2007 show and passed along a copy to their management with good vibes all around. When the CD was released, accolades and popularity soon followed and the band ultimately received a grammy nomination earlier this year. I’ll admit to losing track of MGMT when they blew up, but a recent post on their Facebook page drew us back in — “we are not restricting audio recording all current shows”. Upon reading that invitation I couldn’t help but hope that their positive experience with our taping three years ago helped open their eyes to the positives of a pro-taping policy. As the band is now on tour to support their new release Congratulations, so I bought a ticket for last night’s show at Radio City. The most striking aspect of the night before the lights went down was the age (or lack thereof) of a large portion of the audience — many early teens and pre-teens with their parents. While I guess this is a sign of mass popularity — two sold-out shows at Radio City nothwithstanding — MGMT didn’t pander to the youth. In particular, “Siberian Breaks” is an eight minute song with downbeat lyrics and it appeared in the setlist immediately preceding their most popular number “Kids”. MGMT also took time to explore their psychedelic side as “The Handshake” contained a lengthy dissonant jam. In between, the band did serve up the songs to satisfy the crowd, as “Electric Feel” (sampled below) was the third song of the set. 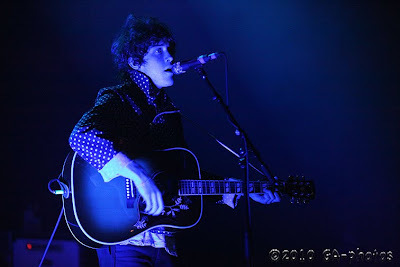 We left with the feeling that although MGMT is probably more popular than even they might have imagined, the band has not lost their focus nor do they cater to the mainstream. I recorded this set from an excellent location in the venue with my best mobile rig. We are a bit disappointed in the level of the vocals in the house mix, but overall the sound is superb. Enjoy! If you email nyctaper for access to this recording, we expect that you will PLEASE SUPPORT MGMT, visit their website, and purchase their CDs from the links at their website (HERE). thank you very kindly, ‘taper! there’s been a dearth of mgmt recordings on this tour, so your generous offering is most welcome indeed. and it looks like you got the better of the two nights…. thanks for sharing! great concert!